The Ninja Professional Blender 1000 (BL610) has a low profile design, making it easier to fit under cabinets on your countertop. The Ninja Pro 1000 is a very popular blending machine with great power for its price . The blender has 1000 Watts of power for blending, cutting and crushing. This type of countertop blender can make smoothies, chop food, and make frozen drinks. The BL610 Blender Total Crushing Technology crushes ice, whole fruits & vegetables. The large 72 ounce container is made of BPA-Free Plastic and is Dishwasher Safe, for blending a variety of ingredients. The cutting blades can be removed for complete cleaning. The lid snaps shut over the container. If the container is not on right, a light blinks on the blender to let you know. The blender also has low, med, high speeds, as well as pulse. This model can also crush ice. Speed 1 (processing & mixing), Speed 2 (Crushing Ice, Milkshakes), Speed 3 (Smoothies, Whole Fruits & Vegetables) The Ninja BL610 comes with a 1 year limited warranty. Ninja Warranty: 1 year Limited Warranty. Smart-Review Commentary: The Ninja brand is a top seller in blenders, and for good reason. 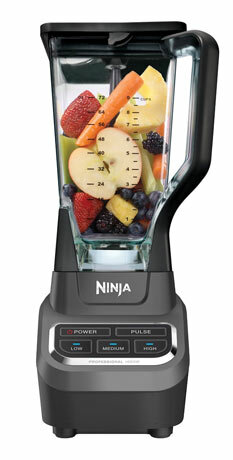 Ninja blenders offer higher power blenders for a lower price. The Ninja Professional Blender 1000 (BL610) has 1,000 watts of blending power. Enough power to make smoothies, crush ice, and make frozen drinks. It is a 3-speed blender, and has a large 72-ounce BPA-free Dishwasher safe container. Different variations of Ninja blenders come with personal cups as well (see choices below). The blender has a safety feature that will detect if the container is not secure, and a light flashes on the blender. The Ninja BL610 has received very good consumer reviews for a blender in its price range. This blender offers tremendous value, with many good basic features, and a 1-year limited warranty. The Ninja BL610 is a Smart-Review top pick for Blenders under $100.